Ranked third in the World’s Best Restaurant Awards in 2011 and with two Michelin stars I knew I was in for a very special dining experience. But what I didn’t expect was to step into a whole different universe! 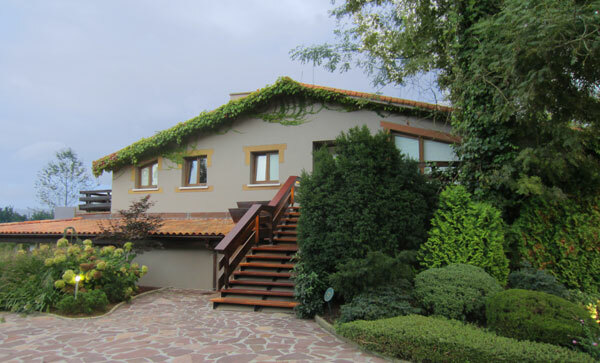 On arrival we were seated in the tranquil surrounds of a lush garden courtyard. 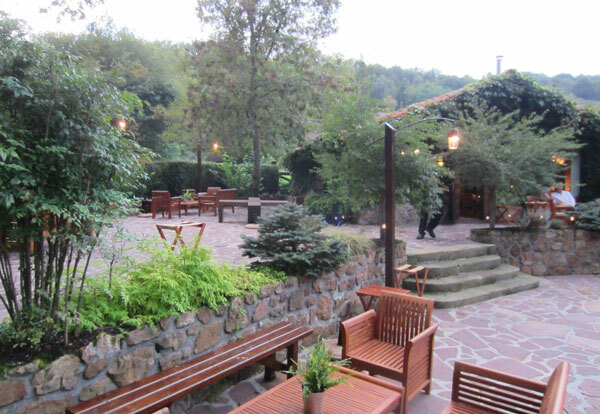 I should mention that Mugaritz is located in a rural setting near the town of Errenteria in north Spain and boasts a backdrop of mountain ranges and dense oak woodlands. You could be anywhere in the world but one thing you do realise is that it’s peaceful and beautiful here. Glasses of champagne were ordered and then the show commenced. We were presented with a small parcel of delicate flowers and leaves in what appeared to be a plastic wrapper but were told to fold in half and put the whole parcel in our mouths. ‘It’s all completely edible’ our waitress said with a cheeky glint in her eye. So we did! And it was stunning. The gelatinous wrapper quickly dissolved in your mouth to reveal the sweet and delicate flavours of freshly picked flowers and peppery leaves from the kitchen garden. This introduction made us giggle like children and we knew from here on end it was going to be an adventurous and fun night. 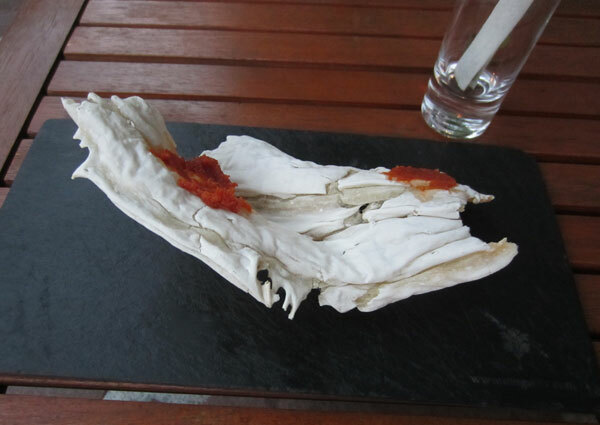 What appeared to be a washed up bit of drift wood then arrived in front of us….it was in fact grilled focaccia. We were encouraged to taste, smell and play with the little treats that kept rolling out. A bowl of pebbles with three larger grey stones atop and a side dish of mayonnaise had us scratching our heads. Was this a trick? Did we just use the stones as a dipper to lick the creamy mayonnaise? Curious! My brother eagerly took up the challenge and placed the stone between his teeth then shaking his head exclaimed; ‘Nope it’s definitely a rock!’ After a lot of laughter I gave the stone a very firm prod and the hard exterior ever so slightly indented under the pressure. Applying even more force, the stone began to crack to reveal none other than the warm flesh of a baby potato! Ingenious! We were now second guessing all of our senses; I think that was exactly the desired effect. After enjoying a warm beer which tasted nothing like beer and more like an earthy miso broth and olives which we expected to be salty but didn’t hold a grain of salt, we were asked to move into the restaurant and be seated at our table. The interior of Mugaritz is very understated; a long open floor space with a dark wooden roof and crisp white linen table clothes. The broken plate sculptures on each table were an interesting touch and the only aesthetic attempt. It was a seamless transition from the tranquil setting of the courtyard to the warm embrace of the restaurant’s interior. We were eagerly anticipating each morsel placed in front of us as the waiters expertly danced around our table placing dishes and clearing them completely unnoticed. 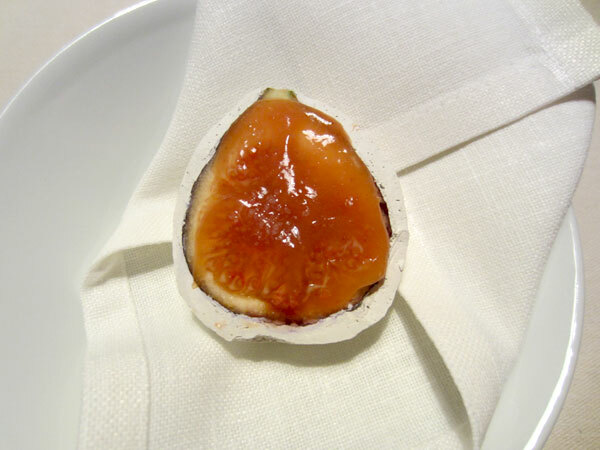 We let out squeals of delight over melt in your mouth homemade mozzarella and savoured the gooey sweetness of fig with a sticky tonka bean glaze – cooked in clay, which after the edible stone we were instructed not to eat! 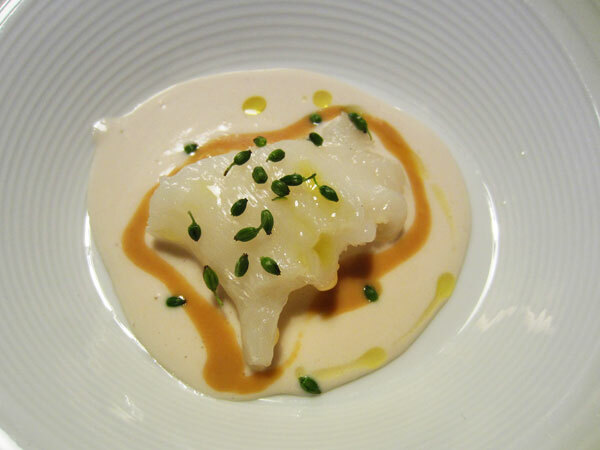 Cod fish over a gelatinous pine nut cream had a surprisingly starchy taste and a very gluey texture. We then got the opportunity to visit the kitchen. Again setting Mugaritz apart from other dining experiences this was such an amazing touch. 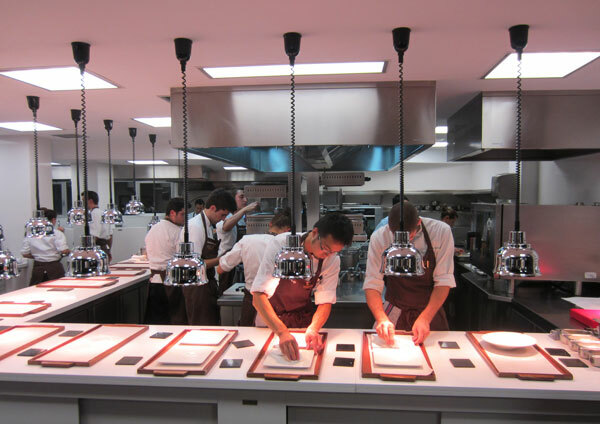 The kitchen was immaculate and filled with young and enthusiastic chefs from all corners of the world. The philosophy behind Mugaritz is to use the best seasonal produce, using only 3-4 ingredients in each dish and with no added salt, butter or oil. The result; carefully crafted dishes which are not only beautifully presented but emit a new world of emotions. Eight courses down in a 20 course menu and I was one very happy diner. The portion sizes were not overwhelming and the pace of the service was perfect. Each dish was received with wonder and delight. It was obvious that the staff at Mugaritz also know that they are in a very special place. They are professional, attentive and passionate about the Mugaritz experience. 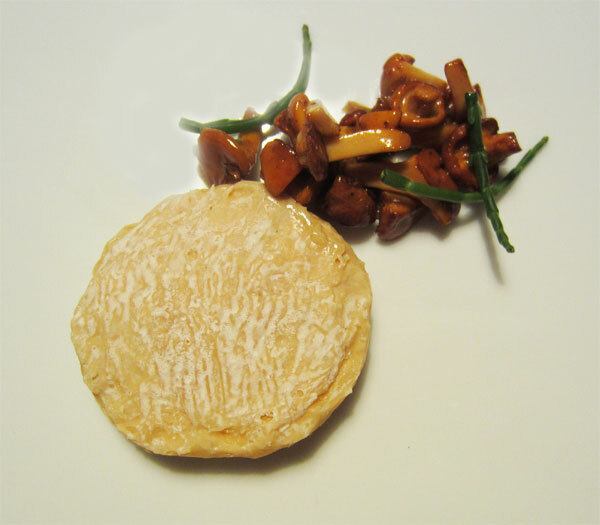 When our dish of ‘cheese’ with mushrooms and samphire was placed on our table the waitress smiled and said; ‘It’s not cheese…can you work out what it is?’ It looked like cheese, it tasted like cheese, or was it all a state of mind! 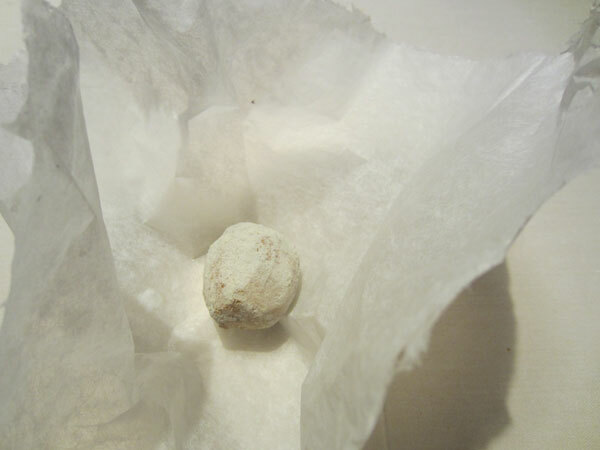 A delicately pegged paper parcel was opened to reveal a star fruit dusted in spices of clove and cinnamon, then came a very hearty hazelnut and bean stew which was so deliciously meaty in flavour and texture. A silky portion of hake with stewed turnip spouts was a table favourite but was then followed up by a deliciously nutty and garlic infused fish stew which had me proclaiming my admiration for this amazing food! What came next had us speechless and wide-eyed! Up until now fish and a predominately vegetarian affair had been presented and we had not even noticed the lack of meat on the menu. 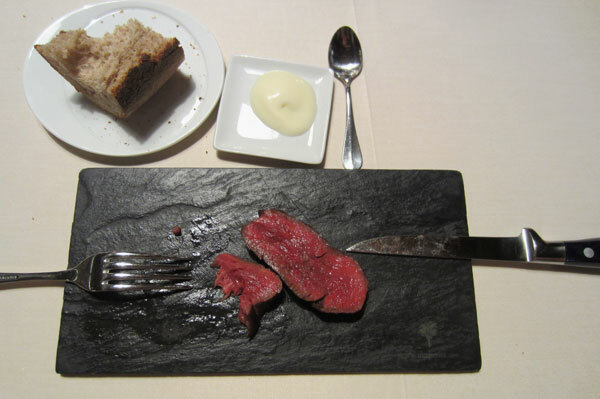 However when two luminous slices of perfectly pink beef arrived on a block of slate our mouths were watering like ravenous carnivores! It was the best piece of steak I have ever eaten in my life! And my fellow diners whole heartedly agreed! We savoured every melt in your mouth-full! And even had to pause to quickly summon up a glass of red wine, we had been drinking white throughout the meal so far, as this steak needed the full attention to detail it deserved. It was served with an emulsion from the steak fat, but we all agreed it did not need any dressing. Where could we possibly go from here…of course…cheese! And so we worked our way through a plate of six different slithers of cheese which intensified in flavour and maturity as we worked our way through from one to six. Again these were divine and some of the best cheese I have eaten, which anyone who knows me and my cheese consumption is saying a lot! I think at this stage I was deliriously content and inexorably in awe! And I was also a little bit excited as I knew only one thing could be next…dessert! And dessert they did deliver! I think the first sweet offering was possibly my favourite course of the night, saying this after I was happy to die after that heavenly steak! 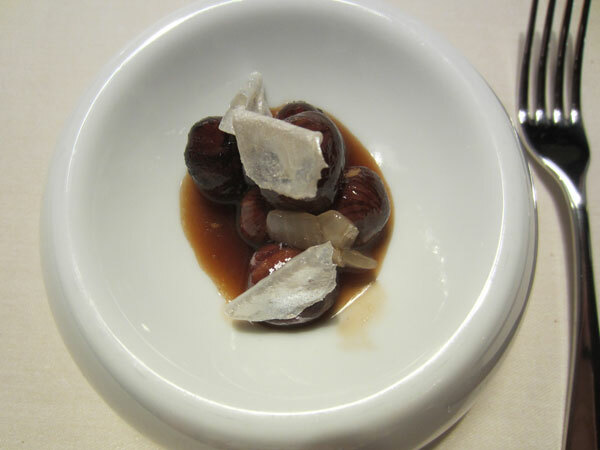 But broken walnuts, toasted and salted, cool milk cream and Armagnac jelly blew my mind. The salty toasted walnuts were dispersed with walnut shaped chocolate with the deliciously sweet brandied jelly centers’. The cream was glossy, fluffy and tasted like fairy floss. It truly was a dessert made in heaven! And yes there was more! A creamy whisky parfait between crisp flax seed wafers was the ultimate ice-cream sandwich. 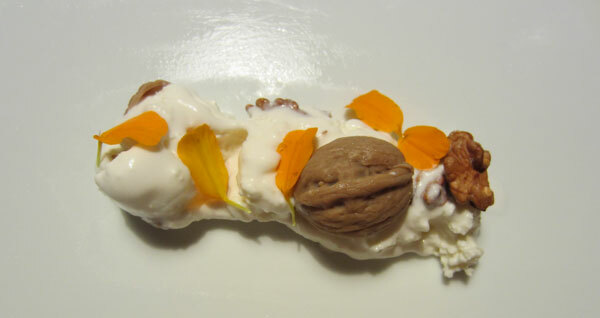 The finale was both beautiful and a little bit quirky which I think sums up the Mugaritz experience. 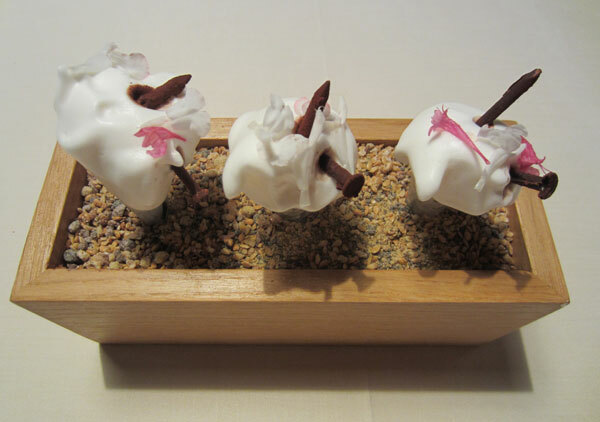 Rice paper ice-cream cones of flowing meringue decorated with nails and flowers! Only at Mugaritz! And so our meal was complete and we were still floating atop the clouds. We glided out of Mugaritz in a bubble of delight. A dining experience of a life time and I don’t think my words here can even begin to convey just how special it really is. I also haven’t detailed all courses or the whole experience as I don’t want to spoil the intrigue for future diners as that is what sets Mugaritz apart. The service was exceptional and a special mention to Nicolas the sommelier who expertly advised us on which Spanish wines would best suit our pallets and our meal. The third best restaurant in the world has blown me away…..there are only two ways to go from here!